Not only are IKEA systems completely modular - meaning, they have enough dimensional diversity to be mixed and matched to fit any requirements - the online design tool allows you to create your kitchen entirely from scratch (or from a template). I have tried the design tools for other large home improvement stores, and I can tell you that none of them can beat IKEA in terms of ease of use and functionality. Sure, sometimes it's slow and freezes up, but it's not nearly as rip-your-hair-out annoying as the other places. Plus, based on your room measurements, you'll see notifications when one cabinet is too close to another and may cause doors to hit something or not open properly. You can also change door fronts, countertops, handles, etc... in one fell swoop and see your itemized list and total cost whenever you like. The modular system came in very handy when we made a measurement mistake and one of our cabinets wouldn't fit. We simply took back the one that wouldn't fit, and bought a different size - voila! - crisis averted. The quality of IKEA cabinets is not the highest on the market, of course, but they are really sturdy. We're not at all worried about the wear and tear. And even then, if one of the fronts gets wobbly or a drawer track breaks, you can easily buy replacements or let it fall under IKEA's 25 year limited warranty. But again, they don't at all feel "cheap" and we love the quality. When you make your order in-store, the workers are knowledgable and will go through each and every piece to make sure you will have everything you need. It takes a couple hours to go through it with them, but considering it costs nothing extra to have an experienced worker make sure your design is okay, the time spent is fine by me. They tell you about shipping options or pick-up FYI's and it's very smooth sailing. It's also super nice to have your entire kitchen before you even start your demo work, just waiting to be put together. Which by the way, though time consuming, is SUPER easy and helps save you moolah. The rail system is amazing. 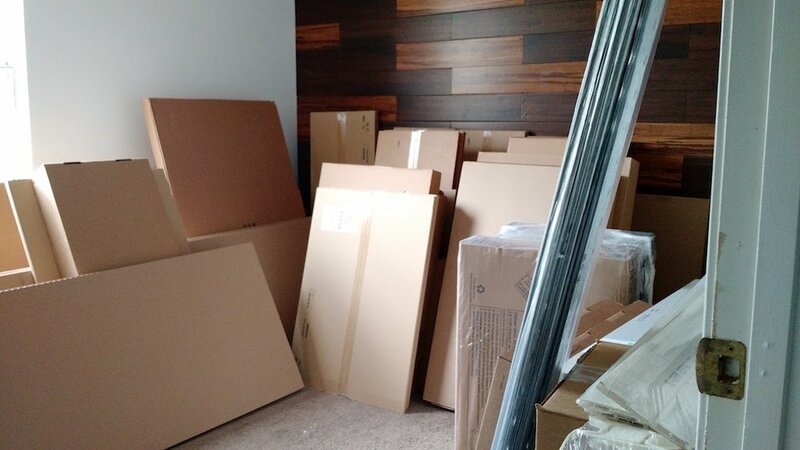 Ever thought about that fact that wall cabinets are actually hung on a wall one at a time? Getting them all to line up and not start sloping down or up can be really hard. 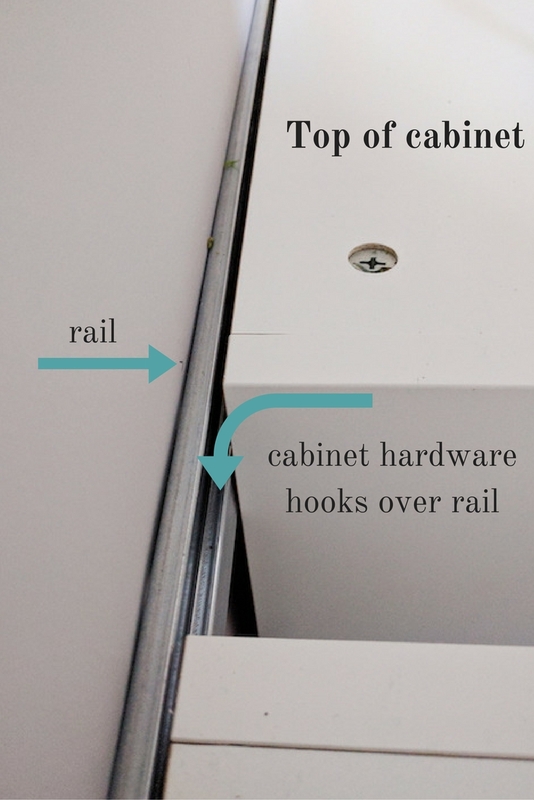 IKEA comes with these long rails that you simply screw into some studs, make sure it's level, and then slide your cabinets on. It makes it so easy and less stressful. Of course it still takes some measuring to be sure your cabinets are the right height from the counters, but it's much nicer than their competitors. Oh, and the base cabinets are rail-hung too! 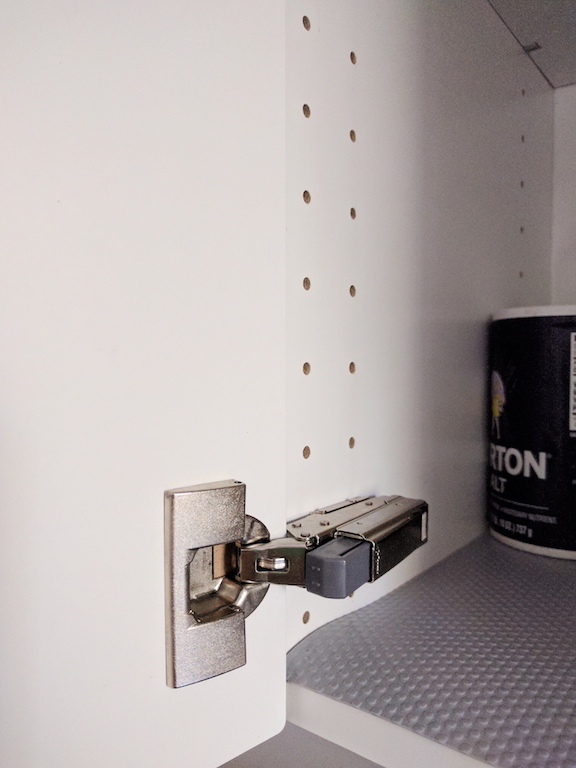 I'm not all that great with power tools, but IKEA's hinges are so ingenious. The holes on the frame of the cabinet are already there which makes screwing in the hinge a piece of cake. On the door front, you just push a metal piece in place (no tools required) and it tightens itself. The piece on the front, snaps easily into the piece on the frame, and you're done. 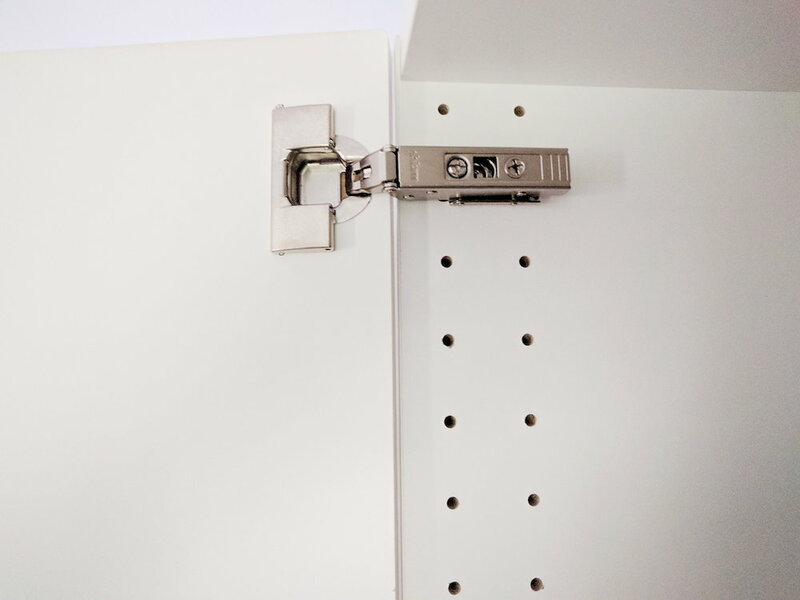 Once it's on, you can use a small screw driver via two holes on each hinge to adjust the door front so it's exactly centered on the frame or lined up with the other cabinet doors. Then, you can add a small "soft close" clip to one of the hinges to finish it off. We probably put all our door fronts on in less than twenty minutes. If you're curious about what I mean, this guy's 2 minute video shows you how easy it is. Honestly, it's almost therapeutic to put on these hinges because it's so painless. No gaps, meaning all your doors are flush with one another. There are no wood gaps that show between the door fronts. Along with that, there are also no lips on the insides of the cabinets. So when you pull a glass off a shelf, it will slide right out instead of hitting a lip on the bottom of the shelf or on the side of the cabinet. Have a two-door cabinet? There won't be a piece of wood running down the center. I love this feature especially under our sink as it makes organization super clean and simple. Tom loves it because if he needs to work on plumbing under the sink, he doesn't have to squeeze into one side. He can open both doors and have free range to lay underneath! Wall Cabinet Depth of 15"
The standard depth of most wall cabinets is 12-13" (I believe) but IKEA's are 15". Meaning, I can fit one stack of plates in the back of a cabinet, and still fit another stack in front of them. If we didn't have a pantry, the depth of those cabinets would be such a life-saver in terms of storage. I absolutely LOVE the added depth. Don't like the door style or colors? Just get some new fronts instead of scrapping the whole thing. Not crazy about the drawer configurations? 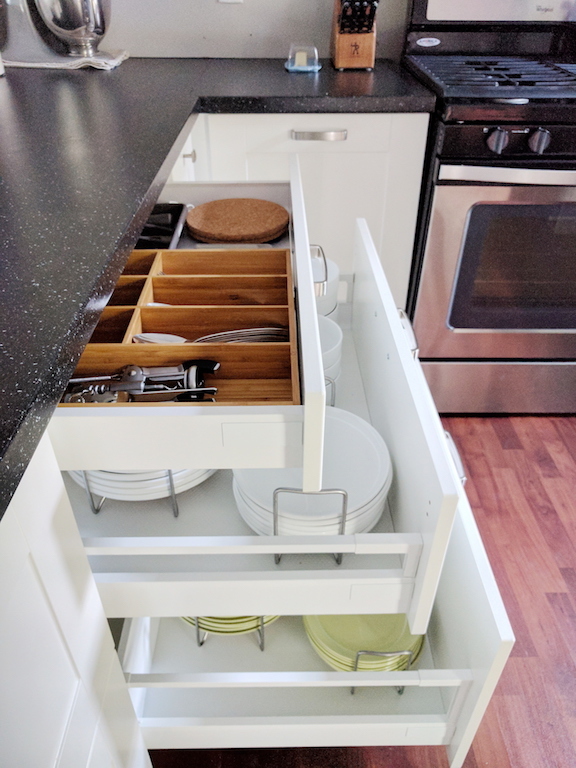 We could swap the drawers of our two 30" wide base cabinets anytime, or just go buy entirely new drawer combos in that width whenever we'd like. No problem! Anything can be undone with such ease and adjusted after the fact with no repercussions. We paid only $250 for probably 45 linear feet of counterspace... which is amazing. Most of IKEA's countertops would require you either cut and install their laminate options yourself, or hire someone to do it for you. We honestly love the quality of their laminate. We cut and installed ourselves, and it doesn't look cheapy to us at all. I think if you live in a great big home with top tier features, a stone or solid surface would make sense, but not in our little starter home :) We also don't give two hoots about the hoopla behind granite, so we'll gladly stick with a nicely done laminate. Plus, if it gets ruined, or we tire from the look, it's only $250 to replace or update! However, IKEA does offer quartz and acrylic options that they do through area third parties who will measure, cut, and install for you. I'm sure once I hit publish I'll think of even more reasons we love our IKEA kitchen, but this is what I've got for now. We are so happy and grateful to have this wonderful kitchen at our fingertips each day. We feel like home chefs and somehow even just pouring a bowl of cereal feels fancier now! As I read this post over to Tom a few moments ago, he said he would add that even if IKEA were more expensive than their competition (Home Depot, Lowes, etc) he would still get IKEA again. The quality is better and the overall features and how it's put together are just smart. Looking to do a kitchen renovation with IKEA and have some questions? Leave me a comment!